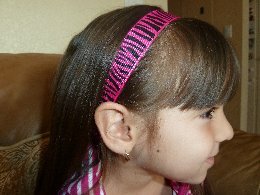 Are you frustrated with hairbands﻿ that are either too big to stay on or too tight for your Lil Princess to want to keep in her hair? I sure was! 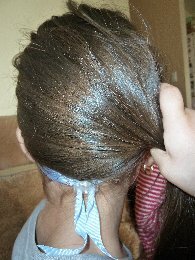 My youngest Diva has fine hair and headbands never seem to stay put in her hair for very long. I tried buying smaller ones but they are too tight and she always ends up yaking them off quickly. I was thrilled to have the opportunity to review The Original Toggle Bandz. 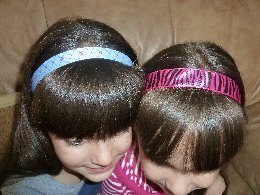 These headbands were created by Amanda Duke, a Stay-at-Home Military wife who was frustrated with headbands that would fall off her daughter's fine hair! What did she do? It's ingenious really! She has added an adjustable plastic toggle to her headbands that ensure a perfect fit! 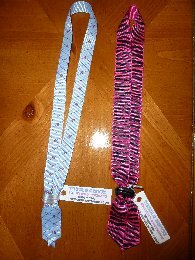 Toggle Bandz are extremely easy to use - just put them over your head and adjust to your liking! That's it! Amanda has so many colors and themes to choose from and she also welcomes custom orders so you can easily match all your outfits with a headband that finally fits! So now the million dollar question - Does it work? YES! My youngest Diva is the real problem! Headbands are almost always too big for her head. She absolutely loved the pink striped design that Amanda sent and requested to put it on immediately! I was thrilled with how it fit and looked on her and she kept it on all day! It did not fall off and it never bothered her at all. I think she actually forgot she had it on! We definitely set a record for length of time wearing a headband with our new Toggle Bandz! definitely get 2 Lil Diva Thumbs Up! 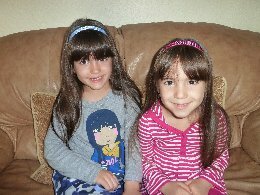 1 Toggle Bandz to 2 Mom to 2 Posh Lil Divas readers! Visit Toggle Bandz and tell me which ribbon choice you would like to win! Disclaimer:I received 2 Toggle Bandz for the pruposes of trying them out for this review. That being said, this review is my 100% honest opinion of this product - I am not paid for my reviews or optinions! They are 100% mine! Please remember that your opinions and tastes might differ from mine. Check back during the week for more great giveaways during our Lil Diva Birthday Review & Giveaway Extravaganza! So many choices! I like the orange with white dots. Anything with Pink and I also like the royal blue with white ploka dots. They look really cute what a great idea.